Sealcoat, specifically refined coal tar, is a mixture of chemicals with a structure that does not allow destructive elements to affect its properties. This material, as a protective coat for asphalt, forms a barrier to protect against weather, salts, oils, and destructive substances that lead to pavement failure. 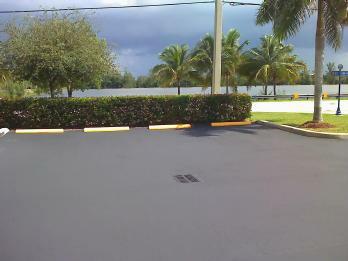 This sealant also restores the asphalt’s rich black color, dramatically improving property appearance. Potential customers’ and guests’ first impression is your parking lot; a fresh, new appearance will be the best presentation no matter your industry. By consistently protecting the asphalt pavement from deterioration and from failure, you are prolonging the life of your original asphalt by as much as eight years, or almost double the expected life of an un-maintained pavement surface, without considerable investment in an overlay or other significant remedy. My parking lot seems fine, why do we need sealcoat? to attack and break it down. As the asphalt molecules break down, much of the original benefits – including weatherproofing – are lost. This is first observed visually by the color change in the asphalt surface: from black to grey. The rate of pavement deterioration depends upon many variables including weather or climate conditions, traffic volumes and frequency of maintenance. After the visual change in color of the asphalt surface, weather, oils and other harmful materials can significantly deteriorate the pavement surface. Oils from vehicle engines, often parked stationary for long periods of time, can cause considerable damage to an un-maintained pavement surface (as pictured). Also, further deterioration of un-maintained pavement leads to minor cracks which become wider and deeper without remedy. If these cracks are not remedied, water and other harmful substances will seep into the base and damage the pavement’s load bearing capacity, ultimately causing pavement failure. The effects of this are shown in serious alligatoring, rutting, and overall pavement failure. Before long, your parking lot is riddled with cracks, potholes and drainage issues that are seemingly beyond repair. Unmaintained asphalt shows its deterioration and damage quickly, in as little as two years, and cracks and potholes quickly develop. Once the cracking forms, lack of proper maintenance will lead to serious liability issues caused by severe potholes and your pavement investment will be in risk of complete failure. The deterioration of unmaintained asphalt happens exponentially faster than maintained asphalt and, consequently, costs much more money over time. It’s a fairly simple straightforward process. Your Parking Lot (done in sections for larger lots or communities) is blocked off to keep out car and foot traffic. The lot is cleaned thoroughly with brooms and power blowers removing loose soil, mud, litter weeds and any other debris. A clean surface will ensure proper adhesion of the sealant. Any oil spots are pre-treated to ensure no bleed through. 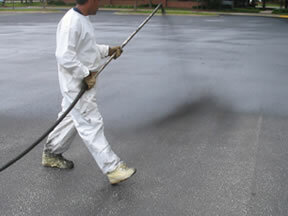 The asphalt is then treated with the sealant in a two coat application. This ensures proper curing of the product. The lot should be kept free of traffic for a minimum of 24 hours to ensure that the product has had ample time to cure and no “tracking” occurs. Once the sealant has cured, the stripes can be painted and the new beautiful lot opened for traffic. During this process, you can be assured that Gold Coast Sealcoat will take every measure to ensure that your business is disrupted as little as possible. Call 954-670-4875 today to extend the life of your pavement!